Everyone loves games and if there is one game that everyone can play it is a pinball machine! Nobody can resist walking past the bright lights and sounds of a pinball machine. It is way for people to relive their childhood and feel nostalgic. Not to mention, it is fun to try and beat the high score of the person before you! 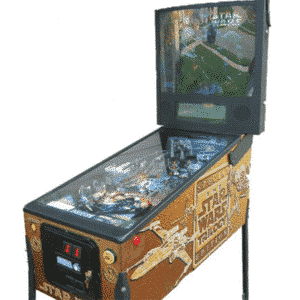 At Arcade Direct, we have a range of pinball machines that you are going to love. You can hire them for any occasion and they are sure to bring the fun. For example, some people hire them for birthday parties and some companies choose them for their PR event. We haven’t met anyone yet that doesn’t like pinball machines! So, have a browse of our pinball machine collection today so that you can make your next event or party a success. So, why should you add a pinball machine to your event, party or venue? Well, you can bring the novelty factor. Pinball machines have always been popular and people will love to reminisce and play their favourite games. Not a lot of people have one in their homes, which makes them more inclined for them to play with their friends. While it is a one person game, it actually has the ability to make people more social too. Everyone can bond over playing pinball and take it in turns to try to beat the high score. As one of the leading suppliers of retro arcade machines, there is no better place to choose entertainment than at Arcade Direct. We pride ourselves on offering some of the most popular arcade machines through the years and reconditioning them to their former glory. We have popular brands such as SEGA and Voyager, as well as the classic games like Pacman and Space Invaders. You are guaranteed to feel nostalgic and enjoy a trip down memory lane with one of our retro arcade machines! From pinball machine hire to shooting and driving games, we have everything you need to throw a successful event or party. We have worked with big names in the past, such as Walt Disney and Sony Entertainment, which gives you the reassurance for your special occasion. Retro arcade games are sure to be a hit at any event, whether it is a corporate event or special birthday. Everyone loves to play games and pinball machines will put a smile on everyone’s face for the night. At Arcade Direct, we offer you the opportunity to hire your favourite pinball machine for competitive prices. You can choose how long you want to hire the machine for. Whether it is one night only or a long term lease for a venue, you can add your favourite game for everyone to have fun with. What’s more, we don’t just let you hire one of our retro arcade machines. We also take care of all of the delivery and set up so that you don’t have to worry. Our trained technicians will get everything ready so that you can concentrate on your event. We will also collect the arcade machine games from the venue once the contract is up. It really is simple to enjoy one of our pinball machines. So, make sure that any occasion you are having is fun and exciting with a pinball machine from Arcade Direct! It is easy to start your hire today and you can contact us at any time if you have any questions about our pinball machines.